﻿Serving Greenville, Spartanburg, Anderso﻿n, Pickens, and Oconee since 1963. Interested in learning about membership at our Branch or Younger Member Group? Please respond by 4:00 on Monday prior to the meeting. If you need to cancel for any reason email ASCEUpstate@gmail.com late cancellations or no shows are subject to charges in the amount of the lunch. 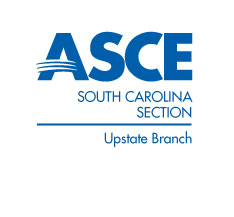 Please check only if you are an ASCE Member. Sign up for Upstate Forever's mailing list to receive updates and alerts for all Greenville-based comprehensive plans. www.upstateforever.org/cp-updates. Plan to participate in 2nd round of public input meetings (likely in May) for Plan Greenville County (comprehensive plan process). Tuesday, April 30th, 8:00 – 11:30 am, Hyatt Regency Greenville. Forum attendance is free but registration is required. Congratulations and a job well done to all of the 4th grade students and teachers that participated in the 2019 event!!! We tested over 350 bridges this year and we can't thank our sponsors and volunteers enough! To see the winners for each category, please visit our Bridge Event page. You can read her paper at the link below. Keisha Brown, teacher with Greenville County schools, has been making these small movies of the Annual Popsicle Bridge Competition that we host for 4th graders. Enjoy the last few years! Check out the Facebook link below for a video!